You are invited to stay at Suite Hideaway, 3 private rooms consisting of a Bedroom (queen), Sitting Room/TV room with small kitchenette and your own personal bathroom. The HideAway is attached to a larger private dwelling, sitting on almost an acre in the middle of a large manicured lawn amid large trees and gorgeous landscaping. You are almost at the end of a cul de sac, one house from the St. Johns River. The HideAway has its own separate and completely private entrance through a gate at the end of the drive way. Every creature comfort is provided and none of your private space is shared. You may, however, enjoy the shared screened back back porch at your leisure or use the grill both of which are steps from your front door. One interior door is the common door but it is lockable from both sides. Enjoy sleeping on a serta icomfort brand new queen mattress and boxsprings (very similar to tempurPedic). The bedroom contains a closet (with terry robe) for hang up clothes or extra shoes or extra anything. Your own cable high definition TV with attached DVD with BluRay is in the large room which contains your private small refrigerator, microwave, toaster oven, Keurig coffee maker and sink. It is equipped with plates, dinnerware, glasses, cups and assorted accessories. A table can be used as a desk or a table for dining. The bathroom is recently remodeled with a new enclosed glass shower. The space is designed for one person but it is equipped to welcome two people. The large easy chair in the main room makes a small bed, rather like a sofa bed. All bed linens and towels are provided. What is unique about this space is the independent monitored security system with smoke sensor. You will be offered a key fob to arm and disarm as you come and go. A control panel snaps a picture every time the door is opened. The HideAway is designed to afford you complete privacy. At some point, depending on the length of your stay, you might have need of the washer and dryer in the main house. This can be arranged with the owners. Maid service, to include bed change with fresh linens and towels is optional and offered at an extra fee. It's a quiet neighborhood. Take a walk in the safe neighborhood. It is a peaceful and tranquil setting. The owners enjoy an array of visiting birds. Wild foxes are often seen in the neighborhood. Two friendly dogs are sometimes roaming the large back yard. One is a border collie, Panda. Teddy is a rat terrier. They will not be a bother. The HideAway is a unique new listing with new everything. It is perfect for students or a traveling business person. We welcome you to be our very pampered guest. Four piece place setting with glasses, cups for coffee and cutlery provided. This is more a kitchenette. Table with one chair in the main room. Table doubles as a desk. I travel a lot and rent a lot for my job. This was by far the best rental experience I've ever had. It is located within 10 minutes of downtown Jacksonville. It was clean, quiet, and everything was perfect. If one their properties is available for rent where you are going, do yourself a favor and get it. Fred and Suzanne are the best. They do a great job. Plus, they are great people. 2500 Characters Can't Describe How Great This Place Is! So, I am not one to blow smoke up your skirt, but believe me when I say: I am absolutely ecstatic about the opportunity that I've had staying at this property. It was incredibly clean, full of amenities, the location is ideal, THE SHOWER DOES NOT FOG UP THE BATHROOM WINDOW - not sure what kind of sorcery was used to make that happen, but it was absolutely breathtaking. The Owners are absolute treasures and constant reminders that there are still good people in this world. Words cannot express how grateful I am, and how I vehemently recommend this property. Do yourself a favor, and book today. Don't look anywhere else. Don't punch numbers - THIS IS THE ONE. I left 100% satisfied, incredibly well rested, and most of all, with new friends, even better - FAMILY. This was truly one of the best rental experiences I have ever had. Fred and Suzanne were excellent hosts; endlessly kind, non-invasive and accommodating. They went above and beyond any expectation for a host. 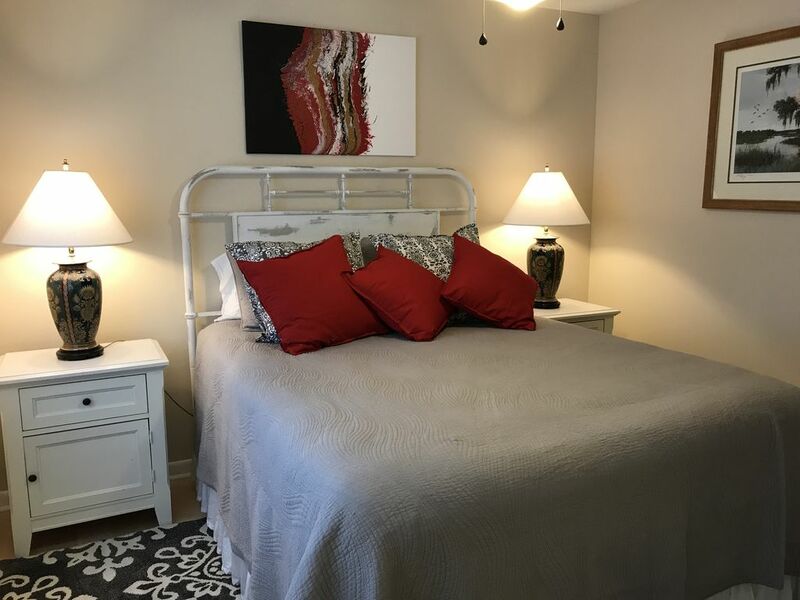 The space is virtually spotless, large, and beautifully decorated, and the home is located in a safe quiet neighborhood no more than a 10 minute drive to downtown Jacksonville. I loved staying here, and would stay again a million times over. I now genuinely consider Fred and Suzanne to be great friends, and look forward to the next time I get to see them. Fred and I enjoyed hosting you, our very first guest. Thanks for noticing the features we put in place to ensure your peace, comfort and pleasure. Clean is key and the top of the list! The Suite HideAway is very centrally located to downtown Jacksonville. The neighborhood is called San Marco. It is 5 minutes from a major north south artery, Hendricks Avenue. San Marco has a trendy shopping district with dress stores, restaurants and movie. Immediately south is the Lakewood neighborhood which offers more shopping, grocery stores and restaurants.